This exhibition, marking the centenary of Aleksandr Solzhenitsyn’s birth, coincided with the launch of the Solzhenitsyn Initiative by the Notre Dame Center for Ethics and Culture as well as the publication of the first English translation of several of Solzhenitsyn’s works by the University of Notre Dame Press. Aleksandr Isaevich Solzhenitsyn (1918-2008) was one of the most influential writers of the twentieth century. His long life encompassed the entire Soviet period of Russian history, whose tumultuous events became the focus of his literary and spiritual interests. Drawing from his own experiences as a young Marxist, as a Red Army artillery captain during the Second World War, and as a survivor of the Soviet labor camps system (the Gulag) and of deadly cancer, Solzhenitsyn embraced the Christian faith and wrote about the tragedy of the Russian Revolution and the evils of the Communist system. Through his open criticism of the Soviet regime, he emerged as a moral and spiritual leader of the anti-Soviet resistance and a spokesperson for all those oppressed and persecuted by Communist authorities. But Solzhenitsyn was not alone in his battles with the totalitarian state. He relied on a clandestine circle of loyal supporters at home and abroad—courageous, committed men and women who risked their lives assisting Solzhenitsyn. They helped him break through the walls of official censorship and deliver his message to the world. Solzhenitsyn dared not name them until after the collapse of the USSR, when he acknowledged their contributions in his memoirs as nevidimki—invisible allies. This exhibition presented a small selection of materials from collections recently acquired by the Hesburgh Libraries and sought to highlight the personal stories of Solzhenitsyn’s invisible allies, and their contributions to the life and work of the great writer. This exhibit was curated by Natasha Lyandres, Curator, Russian and Eastern European Studies Librarian, Head of Special Collections. This exhibit explored the history of newspapers, magazines, and the periodical print revolution in the colony and nation of Peru. It drew on strengths of Rare Books and Special Collections’ José E. Durand Peruvian History collection. A Peruvian scholar and bibliophile (1925-1990), Durand sought out and amassed an unparalleled collection of early Peruvian imprints and periodicals, including an impressive array of nineteenth-century newspapers, circulars, and popular song and verse imprints. Many of these materials come from presses in Lima, the Peruvian capital, while others are from provincial towns such as Cuzco, Arequipa, and Ayacucho. Together these items offered diverse perspectives on Peruvian political events and cultural and religious practices and preferences from the colonial era, through the country’s birth in 1825, and beyond the turn of the twentieth century. This exhibit was curated by Erika Hosselkus, Curator, Latin American Collections, RBSC. Public tours of the exhibit were offered Tuesdays at noon, February through April. Tours were also available for classes or other groups, including K-12 audiences, by request. Primo Levi (1919-1987) was the author of fiction, poetry, essays, memoirs and translations and is best known for his first work, Se questo è un uomo, an account of his detention at Auschwitz in 1944/1945. Before he was a writer Primo Levi was a chemist, and throughout his life the two identities intertwined in fascinating and mutually enriching ways, in a constant exploration of possible links between what Levi called "the world of words and the world of things." Levi's writings reflect his deep engagement with various forms of both scientific and humanistic knowledge, as well as with Jewish culture and wisdom. Governing Levi's work as a whole are a profound love of storytelling and an equally profound desire to communicate in friendship. Levi is rightly considered one of the most important authors of the twentieth century. This exhibit traced the progression and reception of Levi's writings in first editions from the Primo Levi Collection of the Hesburgh Libraries' Department of Rare Books & Special Collections. The Primo Levi Collection, developed in conjunction with Italian Studies at Notre Dame, is one of the most important of its kind outside of Italy. It includes all first editions of Levi's works published within his lifetime as well as first editions of notable translations and adaptations of Levi's writings that document his importance outside of Italy. This exhibit was curated by Tracy Bergstrom. The event featured brief remarks by Tracy Bergstrom (Curator, Italian Imprints and Dante Collection), Vittorio Montemaggi (Lecturer, Religion and the Arts, King's College London), and Valentina Geri (PhD candidate, Italian), followed by a light reception and viewing of the exhibit. Co-sponsored by Italian Studies at Notre Dame and Hesburgh Libraries. This exhibition displayed examples of American Catholicism expressed through (mostly) printed texts from 1783 through the early 1840s. They included the earliest Catholic bibles published by Mathew Carey, and editions of Thomas à Kempis' The Imitation of Christ used and produced in the United States; polemical pamphlets with sexual and political subtexts that flew back and forth across the Atlantic; no-holds-barred dueling sectarian newspapers; books and pamphlets created in reaction to mob violence against the Ursuline convent school near Boston; and official reports that mapped the Church’s growth and growing pains. This exhibit was curated by Rachel Bohlmann and Jean McManus. The exhibition’s curators gave guided tours of the show every Thursday at 12:30 pm, February through March, excluding March 16 (February 2, 9, 16, 23, March 2, 9, 16, 23, and 30). Tours lasted up to an hour. If you are planning to bring a group to Special Collections or would like to schedule a special tour, please email rarebook @ nd.edu or call 574-631-0290. Catherine O’Donnell, "Saint Elizabeth Seton: A Reading Life"
Historian and former Cushwa Center Fellow Catherine O’Donnell gave a public talk in which she explores Elizabeth Ann Seton’s spiritual journey as it intersected with Catholic history during the early American Republic. Seton converted to Catholicism as an adult and was canonized in 1975—the first native born American to be so. Kyle Roberts, "21st Century Digital Approaches to Rethinking 19th Century Catholic Print"
Although scholars have long focused on nineteenth-century Protestants as people of the printed word, Catholics also availed themselves of print. Their published works remind us of American Catholics’ transnational identities, in which they balanced allegiances to the state, homeland, and the global Catholic Church. This talk explored the ways in which new digital humanities projects, such as the Jesuit Libraries Provenance Project, have allowed us to recover the central importance of print to American Catholics. "Ingenious Exercises" presented a selection of books on sports and physical culture published in Western Europe in the 16th, 17th, and 18th centuries. Among the concerns of these volumes are the description and evaluation of the sports of classical antiquity; the benefits of different forms of physical activity for human health; and the integration of sports and exercise into children’s school curricula. There are also volumes that perpetuate long, rich bibliographic traditions, like the martial arts manual and the sporting or hunting book. Also present is Bardi’s treatise on Florentine calcio, the first book published on football. The advent of the printed book stimulated the growth and rationalization of sports by disseminating rules and other standards, anticipating the highly regulated sports culture of the 19th and 20th centuries. This exhibit was curated by George Rugg (Joyce Sports Collection). Guided tours were offered regularly by the curator, George Rugg. Tours met by the entrance to the Rare Books and Special Collections Department (102 Hesburgh Library, first floor). Reservations were not necessary. If you are planning to bring a group to Special Collections or would like to schedule a special tour, please email rarebook @ nd.edu or call 574-631-0290. Manuscripts, incunabula, seals, maps, engravings, and printed books from the thirteenth century to the present highlight how the Holy Father has left his mark on society. These materials from RBSC, together with a great bull on loan from Saint Mary's College, are featured in the new exhibit “Vestigia Vaticana.” The exhibit's opening coincided with the conference The Promise of the Vatican Library, being held May 8–10, 2016, at the University of Notre Dame. These materials are like the Vatican's footprints. They provide a trail for us to follow to get a glimpse of the official acts of the Holy Father, of books that belonged to popes, of events the general public wasn't privy to. Take a stroll through the exhibit to see these papal bulls, apostolic briefs, a papal conclave print, a ground plan of Rome, and various other pieces. This exhibit is curated by Dr. David T. Gura (Curator of Ancient and Medieval Manuscripts). An international academic conference highlighting the holdings of the Vatican Library and opportunities for future research. 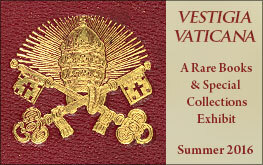 An exhibition of twelve works from the Vatican Library's vast holdings supplements the conference. These objects, including Greek and Latin manuscripts, early printed books, fifteenth-century music, numismatics, and sixteenth- and seventeenth-century representations of the Eternal City. When most of the leaders were executed, sympathy for the rebellion spread throughout the world. The poem by W. B. Yeats, Easter, 1916, written in the aftermath, describes how a military failure carried out by unlikely people became transformative. The Hesburgh Libraries Rare Books and Special Collections includes a rare copy of this poem, in addition to documents and books by and about the leaders of the Rising. The exhibit featured items from our Easter Rising Ephemera collection, from our Irish Manuscript collection, and from our book and newspaper collections. In addition, material from the Notre Dame Archives helped us to see the international aspect of the Easter Rising. This exhibit was curated by Aedín Clements (Irish Studies Librarian). "The Worlding of Irish Studies" provides a theme for the 2016 American Conference for Irish Studies' annual gathering. With Irish Studies increasingly seen through multinational eyes, this meeting will address the current placement of Ireland and Irish Studies. Macbeth, Julius Caesar, Twelfth Night. These celebrated plays and 15 others by Shakespeare might very well have been lost to us today without the First Folio, the first collected edition of William Shakespeare's plays. In celebration of the 400th anniversary of Shakespeare's legacy, the Folger Shakespeare Library has launched a national tour of the First Folio—the University of Notre Dame was selected as Indiana's only host site. Thanks to a partnership forged between Shakespeare at Notre Dame, Hesburgh Libraries Rare Books and Special Collections, and the Robinson Community Learning Center, the Notre Dame community and surrounding region had a rare opportunity to experience this historic and famous book first hand! Housed in the Rare Books and Special Collections gallery of Notre Dame's Hesburgh Library, Notre Dame marked the official first stop of the First Folio national tour and exhibit, titled First Folio! The Book that Gave Us Shakespeare, on tour from the Folger Shakespeare Library. Only 233 copies exist of this first collected edition of Shakespeare's plays, and we were honored to be the first of only 52 sites to host this treasure from the world's largest Shakespeare collection. Shakespeare at Notre Dame, along with faculty from the College of Arts and Letters, and members of the distinguished Shakespeare residency company Actors from the London Stage also hosted lectures, performances, workshops, and special displays throughout the month of January to complement this momentous occasion. Explore innovations in the dissemination of knowledge in Germany during the long sixteenth century. From the marriage of text and image on the printed page to the use of censorship and propaganda to the manuals of advice and instruction, witness the dynamic intellectual life of Germans between 1450 and 1650. This exhibit was curated by Dr. Julie Tanaka (RBSC Curator and Western European History Librarian). September 11th, 4:30 p.m. - 6:30 p.m. The opening of our Fall 2015 exhibit. Thomas A. Brady, Jr. (Professor Emeritus, University of California, Berkeley) spoke, reflecting on how Notre Dame inspired and challenged him to become a historian of Germany and of Christianity during this exciting century. The exhibit coincided with a conference being hosted by Notre Dame. ​Beyond Tradition: Rethinking Early Modern Europe highlighting the exciting new directions that teaching and research on Early Modern European subjects are taking. The conference featured scholars and students presenting their current research, a workshop on using special collections materials, the exhibit opening, and concluded with an interdisciplinary roundtable discussion about the new directions in early modern studies. This exhibition highlighted the variety of medieval liturgical manuscripts and fragments housed in the University of Notre Dame's Hesburgh Library which contain music. The manuscripts featured date from the eleventh through fifteenth century, and originate from various regions in France, Germany, Austria, and Italy. Some examples represent specific uses such as Carthusian monks or Dominican nuns. Other manuscripts in this exhibit were recovered from book bindings, and serve as examples of older practices which may no longer exist in complete manuscripts. The exhibit was curated by Dr. David T. Gura (RBSC Curator of Ancient and Medieval Manuscripts, Early Imprints & the History of the Book). The exhibit coincided with the Medieval Academy of America conference, held at Notre Dame 12-14 March 2015, and was featured as the cover story for ND Works in June 2015. This exhibition presents a dramatic portfolio of fourteen lithographs by the Russian avant-garde artist Natalia Goncharova (1881–1962) from the Hesburgh Libraries Collection. Published in the fall of 1914, the lithographs represent one of the earliest and most profound artistic responses to the outbreak of the Great War. They tell an epic and "mystical" story about the eternal struggle between good and evil, destruction and redemption, in which national, traditional, religious, apocalyptic, and contemporary images are intertwined. Co-sponsored by the Hesburgh Libraries, Snite Museum of Art, and the Nanovic Institute for European Studies, and organized by Russian and East European Studies Librarian Natasha Lyandres, the presentation is part of a series of lectures, courses, performances, exhibitions, and other events commemorating the First World War. In conjunction with the annual meeting of the Medieval Academy of America in March, this exhibition focused on reassembling a fifteenth-century book of hours that originated in Brittany, France. Of the 91 manuscript pages he had already recovered, David T. Gura, curator of ancient and medieval manuscripts at the University of Notre Dame's Hesburgh Library, selected about 35 of the most compelling examples, offering visitors an opportunity to virtually walk through a medieval prayer book, page by page. This exhibition was organized by Hesburgh Library, Department of Rare Books and Special Collections, in collaboration with the Snite Museum of Art and was presented with support from the Snite General Endowment. As a textual form, the diary is an autobiographical narrative whose daily or periodic entries record the writer's experiences, observations, and reflections. The maintenance of diaries has been a familiar feature of American culture, high and low, since the 17th century. The Power of my Pen to Describe showcased a selection of American manuscript diaries written over a period of some 150 years, 1745 to 1896. Some of the texts treat singular episodes in their authors' lives, like travel on the Oregon Trail or service in the Civil War. Others are diaries of the quotidian, treating the everyday experiences of (for example) a Massachusetts textile worker or a Washington DC socialite. All items in the exhibit derived from the North American manuscript holdings in the Hesburgh Libraries' Rare Books and Special Collections. This exhibit was curated by George Rugg, RBSC Curator of North American Manuscripts. For additional information about this exhibit, visit the exhibit's Web site. Robert Creeley (1926-2005) was one of the most influential and beloved American poets of the twentieth century. With support from John J. and Terrie Bollman, the Howard and Evangeline Phalin Collection in English and American Literature, and the President's Circle, the Hesburgh Library acquired in 2011 nearly all of the books from Robert Creeley's personal library. 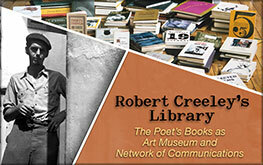 This exhibition of select materials from Robert Creeley's library demonstrated the vital and remarkably extensive range of his network of communications and ultimately made evident his centrality to the literary and visual arts of his time. The exhibit was curated by Stephen Fredman (Department of English). Design by Sara Weber (Digital Projects Specialist, Special Collections). Conservation and preparation of materials by Liz Dube (Conservator, Preservation) and Diane Sikorski (Conservation Technician, Preservation). Planning and coordination by the Hesburgh Library Exhibit Committee. The Robert Creeley Symposium was held Friday, February 7, 2014, in conjunction with the exhibit, and brought together the poet's wife, Penelope Creeley; the publisher of Granary Books, Steve Clay, who assembled the collection; Kaplan Harris, Associate Professor of English, St. Bonaventure University; and a roundtable of Notre Dame graduate students who have cataloged the collection. For more information about this exhibit and symposium, as well as videos from the symposium, please visit its Web page. In 2003 the Hesburgh Libraries acquired the Irish Fiction Collection of Rolf and Magda Loeber. The Loebers are the authors of A Guide to Irish Fiction, 1650-1900, a monumental study and annotated bibliography of fiction written by Irish authors, set in Ireland, or related to Ireland. The acquisition of the Loeber Collection of over two thousand books, generously funded by Dr. Michael W. J. Smurfit and Dennis F. and Ellin C. Murphy, marked the launch of the Hesburgh Library's ambitious Irish Fiction Initiative. Children's literature forms a very interesting subset of this collection. The nineteenth century saw the development of stories with a moral purpose and later a trend towards books designed to delight and amuse children. By the twentieth century a number of genres of youth literature are in evidence including girls' stories, adventure stories and picture books. Nationalism, folklore, the Irish language and the culture and customs of rural Ireland emerge in twentieth century Irish children's literature. In the late twentieth century, children's books deal with Ireland's history and also problems of Irish society. The Famine, the War of Independence, and the Northern Ireland Conflict form the background of a number of novels from the late 1970s on. Several contemporary Irish authors and illustrators are known throughout the world, and this exhibit highlighted a few of their works. Tír na nÓg is the Land of the Youth, a mythical otherworld that features in the Fenian cycle of Irish tales. This exhibit was curated by Aedín Ní Bhróithe Clements (Irish Studies Librarian). Design by Sara Weber (Digital Projects Specialist, Special Collections). Conservation and preparation of materials by Liz Dube (Conservator, Preservation) and Diane Sikorski (Conservation Technician, Preservation). Research assistance by Rebecca Rossi (ND '14). Planning and coordination by the Hesburgh Library Exhibit Committee. Poster illustration from Rosamond Praeger, Further doings of three bold babes. On July 5, 2011 a fifteenth-century Book of Hours (private prayer book) was auctioned by Sotheby’s in London. Lot 113 of their Western Manuscripts and Miniatures sale sold for a modest price to an anonymous buyer. Lot 113 found its way to Germany, where it was cut apart so its leaves could be sold individually—a practice called book breaking, which is all too common. By October, numerous leaves from the manuscript were put up for auction on eBay sites in several countries by a dealer in Leipzig, Germany. The purchase of individual leaves encourages book breaking. Thus, the Hesburgh Library does not usually buy single leaves, but exceptions are made in significant cases. Breton manuscripts are among the rarest due to the extremely small number which survive. A peculiar calendar was up for auction in February 2012, which one of the Library’s curators was able to localize positively to Vannes, Brittany ca. 1450. It is crucial that a calendar remain intact—if the months are separated important details are forever lost. What started as an attempt to preserve an extremely rare medieval calendar became an effort to reconstruct an entire manuscript (now called Frag. III.1). This exhibit showed what this manuscript had been and what it has become. This exhibit was curated by Dr. David T. Gura (Curator, Ancient and Medieval Manuscripts, Early Imprints & the History of the Book). The Polievktov-Nikoladze Family Papers, acquired by the Hesburgh Libraries in 2006-09, derive from three generations of a prominent and historically significant Georgian family (download a PDF of the family tree and exhibit highlights). The collection also includes the papers of Mikhail Polievktov, a leading historian of the St. Petersburg school of Russian history, notable among which are the transcriptions of interviews with leaders of the February Revolution, conducted in May 1917 by a commission he himself organized. The collection includes previously unexamined personal and professional correspondence, diaries, memoirs, photographs, and other manuscript formats. This exhibit was curated by Natasha Lyandres, Russian and East European Studies Bibliographer. For more information about this exhibit, please visit its Web site. "Irakli Tsereteli and the February Revolution"
Rex A. Wade, University Professor of Russian and Soviet History, George Mason University. "The Perils of Memory: Mikhail Polievktov, Self-Erasure, and the Writing of Russian History after 1917"
Gary M. Hamburg, Otto M. Behr Professor of European History, Claremont McKenna College. "A Nation within the Russian Empire: Georgia at the Turn of the Twentieth Century"
Ronald G. Suny, Charles Tilly Collegiate Professor of Social and Political History, University of Michigan. Download a PDF version of the lectures poster. Texts displayed ranged from Homer to Boethius, from Roman law to the rules of Latin grammar. The exhibit's focus was on how medieval and renaissance readers interacted with and re-inscribed these texts, on how text and annotation merge (or compete) on the page. Present-day Post-Its, highlighters and electronic stickies continue a tradition of annotation illustrated here with examples of books written, printed, and subsequently written on, from the collections of the Hesburgh Libraries. The exhibit was co-curated by Dr. David T. Gura, Curator of Ancient, Medieval & European Manuscripts, Early Imprints, and History of the Book, and David Sullivan, Librarian for Classics and Byzantine Studies. The proverb's origins may relate to the Roman monument known as the Milliarium Aureum, or golden milestone, erected by Emperor Caesar Augustus in the central forum of ancient Rome. All distances in the Roman Empire were measured from this point and it was regarded as the site from which all principle roads diverged. As such, artists such as Giacomo Lauro, whose rendition of the Milliarium Aureum appears in this exhibit, often used it as a metaphor for the intensely cosmopolitan culture that has long been present in Rome. The materials on view in this exhibit were recent purchases made through the Library Acquisitions Grant Program. Titled "All Roads Lead to Rome," this generous grant sought to strengthen the Library's scholarly holdings within the subject areas of cartography, monuments, and travel. Within these categories, interdisciplinary purchases pertaining to archaeology, music, history, and the development of the Vatican were also made. This exhibit presented a selection of these recent acquisitions that are now available for use by faculty and students within the Department of Rare Books and Special Collections. "...seduced by the beauty of the letter forms themselves." Printing with movable type began in Europe in the middle of the fifteenth century with Gutenberg. The mechanics of printing remained fundamentally unchanged from their development by Gutenberg until the introduction of steam-powered rotary presses during the Industrial Revolution, over three hundred fifty years later. It was common that a small publishing house would have relatively few fonts with which they would print their books. Even larger printing families did not have readily available the vast number and variety of options that exist on today’s desktop computer. Selecting a typeface was for centuries a matter of what was in style and therefore available — a rise in the popularity of one style of typeface often led to older, less favored type being melted down to provide the raw material to cast type in the new style. The popularity of a typeface reflected the the characteristics it was perceived to embody. Letterpress faces considered in this exhibit were valued for their relationship to manuscripts hands, because of economic considerations, or due to their perceived relationship to the prevailing philosophies of their day. This exhibit traced the stylistic shifts of printed letter forms over the three hundred years that the handpress was the method for printing books, and examined some of the societal influences that led to and informed those changes. "Words on Play" was an exhibit of early baseball publications and manuscripts drawn from the holdings in the Department of Rare Books and Special Collections, Hesburgh Libraries of Notre Dame. Over the course of the nineteenth century, American baseball evolved from a localized folk game of English origin to a codified sport of broad popular appeal, commonly cited as the "National Pastime." Clubs of young men dedicated to playing the game began to appear in earnest in the New York City area in the second quarter of the century; the rules they established became the basis for the sport as we know it today. In the post-Civil War years baseball became thoroughly commodified: crowds of paying spectators gathered in enclosed "parks" to watch celebrated professionals compete at an elite level. By 1900 baseball had entered the mainstream of American popular culture, and had been imbued with many of the mythologies that would persist in the minds of its celebrants well into the twentieth century: baseball as pastoral ideal, baseball as an exercise in democracy, baseball as secular religion. As a recreational form, then, baseball originated in England, but as a form of sport it is American, for it was in America that the game became standardized, organized and popular—and, one might add, the subject of a literature. The printed word both recorded baseball's growth and stimulated it. In the first few decades of the nineteenth century the game is mentioned mainly in children's recreational manuals. Baseball's rapid rise after mid-century was accompanied by a growing commentary, mainly in sporting newspapers and paper-bound annual guides, describing, discussing, and otherwise publicizing the game. By the 1880s and 90s coverage of professional baseball in urban daily newspapers had became routine, and many of the familiar genres of baseball book—histories, autobiographies, fiction—had made their appearance. Baseball journalists—who authored many of the books in this exhibit—never tired of emphasizing their contribution to the game's success, and that contribution was no doubt great. Still, the number of baseball monographs published in the nineteenth century was not large; "Words on Play" brought together copies of most of the key publications of baseball's early history. Eric Gill (1882-1940) was an English engraver, sculptor, typographer, and writer. A social reformer as well as a designer, his activities straddled a variety of disciplines and intellectual movements. Gill began his career in London, but in 1907 moved to the small village of Ditchling, Sussex. With the presence of Gill, Edward Johnston, Hilary Pepler and others, Ditchling emerged as the home for a community of artists and designers who banded together to create the Guild of Saint Joseph and Saint Dominic. All Art Is Propaganda was an exhibition organized by University of Notre Dame undergraduate students Micahlyn Allen, Kelly Fallon, and Juliana Hoffelder under the direction of John Sherman of the Department of Art, Art History,& Design. During the fall of 2009, the group met weekly in Special Collections to work firsthand with the materials and also travelled to London to research connections between materials held at Notre Dame and other institutions. The resulting exhibition examined Gill’s distinctive synthesis of traditional and modern sensibilities that position his work at a unique intersection of modern art, design and culture. Micahlyn Allen, a Graphic Design major, explored how her creative process as an artist can be best understood when seen in the light of honoring God’s act of creation. This is an approach that Eric Gill, Philip Hagreen, and others took in their work. Kelly Fallon examined the collection from an Art Historian’s point of view. Kelly saw the sacred foundation central to Eric Gill’s religious work extending into his public commissions as well. Juliana Hoffelder, a Political Science major, looked at Gill’s work from a political perspective. Juliana researched how Gill’s religious beliefs gave him the vocabulary to increasingly make provocative political statements with his artwork. Two articles in the Notre Dame Observer profiled this exhibit and the group’s excursion to London and Ditchling. Among the holdings in the Hesburgh Libraries’ Department of Rare Books and Special Collections is a small but significant body of nineteenth century materials relating to Abraham Lincoln. There are, for example, several signed documents dating from Lincoln’s years in the White House; groups of printed items from the presidential campaign of 1860, and from the months following Lincoln’s assassination in 1865; important editions of early biographies, including those by Isaac Arnold, William Herndon, and Nicolay and Hay; and the working manuscript of a lecture on Lincoln by the Irish writer Bram Stoker. Many of the items in this exhibit came to the Libraries in 1967, as gifts of Walter J. Trohan (ND ‘26). Walter Trohan is best remembered as a political journalist, whose work at the Chicago Tribune culminated in a long tenure as the paper’s Washington bureau chief (1949-1969). But he was also a book collector of note; some 500 of his first and fine editions (mostly in the areas of British and American literature, and, of course, Lincoln) now grace the rare books holdings in Special Collections. Trohan’s first bequest of books was in 1957; he continued to present items from his collection, on an annual basis, for many years. In this, the 200th anniversary of Lincoln’s birth, we took the opportunity to present a body of materials that were a particular passion of one of Special Collections’ most important benefactors. The Libraries also wish to thank University Archives, who for the purposes of this exhibit graciously lent two Lincoln manuscripts from their collections. This exhibit was curated by George Rugg, Curator for Special Collections. Few periods in the history of Christianity were more consequential than the Reformation era, from the fifteenth into the eighteenth centuries. Myths persist about Roman Catholicism in this era as just a rearguard reaction against the Protestant Reformation. In fact, widespread recognition of problems within the Church at every level antedated Martin Luther’s protest against indulgences by more than a century, and inspired a wide range of reforming activism. The books and photographs displayed in this exhibit reflected various aspects of these efforts as they coincided with the impact of printed books in the sixteenth and seventeenth centuries. Themes covered included the Council of Trent, apologetics, missions, and the roles of humanism, Biblical Studies, and the Jesuits, as well as the revitalization of devotion and piety. This exhibit was curated by Alan Krieger, Theology/Philosophy Librarian, assisted by Ben Panciera and Sara Weber (Special Collections) and Professor Brad S. Gregory, John McCormack and Hilary Nawrocki (History Department). The Index of Prohibited Books was created in the 16th century by the Catholic Church in an attempt to control the spread of Protestant doctrine and other undesirable literature. It persisted for over four hundred years before being abolished in 1966. For much of the last two centuries of its existence, it operated in societies that generally presumed that free citizens had a right to read what they wished. This exhibit examines how the Catholic Church sought to influence the circulation of ideas in the 19th and 20th centuries and what sort of material was considered dangerous. This exhibit was curated by Ben Panciera, Rare Books Librarian and Curator for Special Collections. The books in this exhibit, dating from the seventeenth to the twentieth century, had one thing in common: They were written by Irish people who lived in other countries. The books represented a number of groups of exiles, such as Franciscan priests in Europe or rebels who found a home in America in the nineteenth century. They also represented emigrants such as Captain Francis O’Neill, one of the greatest collectors of Irish music, who gave his personal library to this University. Others still worked for the British Crown, as military officers or, as in the case of Richard Robert Madden, as a colonial administrator. The story of the Irish Diaspora is a vast and complex one — this exhibit touched on a few areas of that story. This exhibit was curated by Aedin Clements, Irish Studies Librarian. Even after 150 years, the appeal of the Confederate States cavalry for students of the Civil War seems undiminished. Infantrymen may have grumbled that the cavalry were "mounted dandies" who escaped the hardest realities of the war, and subsequent historians could debunk the exploits of men like Stuart and Forrest, but the feeling persists: there was just something about the Southern cavalry. This was the focus of the exhibit Writing into History: Confederate Cavalry Manuscripts from the O'Grady-Barrier Collection, on view in the Department of Special Collections during the fall of 2007. This exhibit consisted primarily of military records, personal letters, diaries, and other Civil War manuscript material, written by or about members of the cavalry arm of the Confederate States army. There were also printed materials of Confederate origin (books, manuals, broadsides), photographs, and artifacts. All the items in the exhibit have been acquired by the University Libraries over the last four years, through the generosity of Beverly (SMC '63) and Robert (ND '63) O'Grady. May 23, 2007 marked the 300th anniversary of the birth of Carolus Linnaeus, the Swedish botanist whose system of classification revolutionized the biological sciences. To commemorate this tercentenary, this exhibit featured material from the Edward L. Greene collection of rare botanical books and its especially rich holdings in pre-Linnean materials. This exhibit documented the development of botany in the early years of printing, including attempts to catalog the natural world, the use of botany in medicine, the lingering influence of the ancient Greek scientific authorities, the impact of global exploration, the continuing presence of magic and superstition in botanical studies, and early attempts at systematizing botanical knowledge. The exhibit concluded with selected first editions of the works of Carolus Linnaeus. Edward L. Greene was a distinguished botany scholar and book collector who briefly served on the faculty at Notre Dame. His collection, which he willed to the university, comprised 4,000 books, of which 1,700 are currently held in Special Collections. His donation forms one of the richest collections of its kind in the country and one of the jewels of Notre Dame's rare books collection. Reinaldo Arenas, Jorge Luis Borges, Julio Cortázar, Macedonio Fernández, Oliverio Girondo, Ricardo Güiraldes, José Lezama Lima, Leopoldo Lugones, Gabriela Mistral, Pablo Neruda, Silvina Ocampo, Victoria Ocampo, Juan Carlos Onetti, and Manuel Puig. The exhibit documented the creation, communication, and publication of literature. The creative process is the heart and soul of a writer's life. There were several manuscripts of works in progress and several that have never been published. Correspondence included in the exhibit exemplifies the importance of friends and colleagues in discussing art and life's day-to-day events. Finally, the authors' considerable effort to make their creative efforts available to the public is often overlooked, and so the exhibit included proofs and correspondence centered on the publication process. Together, these materials brought the Latin American writer's world to life. This exhibit was curated by Scott Van Jacob, Iberian and Latin American Studies Subject Librarian. The years between World Wars I and II marked a high point in the design and execution of college football game program covers. With color photography not yet a viable option, covers were reproduced from prints, paintings, and drawings, executed by campus amateurs and nationally known illustrators alike. Representing College Football presented some 60 inter-war program covers, drawn from the extensive collection of programs housed in the Libraries' Department of Special Collections. This exhibit was curated by George Rugg. The Department of Rare Books & Special Collections is home to those Library materials that need special care because of age or scarcity, or because they belong to a particular research collection. This exhibit provided a fundamental introduction to these interesting and unique items. Does Notre Dame own a Gutenberg Bible? Do you really have a book bound in human skin? Does a book have to be old to be rare? What is a mark of provenance and how does it appear in a book? Featured in the exhibit were examples from nearly every collection and format, from ancient cuneiform to Colonial currency to modern first editions. This exhibit was curated by Benjamin Panciera, George Rugg, and Sara Weber. This exhibit presented a selection of works of illustrators of the Inferno since the 1920s. It included some of the most renowned artists of the twentieth century offering their interpretations of Dante's 13th century classic. The illustrations ranged from the classically representational to the highly abstract. For many illustrators, the depicting the Inferno is more an opportunity to comment on contemporary times than to illuminate Dante's vision. Most of the books and plates in this exhibit come from the Zahm Dante collection in the Department of Special Collections. This exhibit also featured the work of two contemporary artists presently at work illustrating the Divine Comedy: Jennifer Strange and David Voros. This exhibit was curated by Benjamin Panciera, Rare Book Librarian in the Department of Special Collections. In Spring of 2003, the University of Notre Dame purchased a collection of Irish fiction from Dr. Rolf Loeber and Dr. Magda Stouthamer-Loeber. This exhibit included many items from this remarkable collection of almost 2,000 works of fiction, plus outstanding examples from existing collections, including a manuscript letter and first editions by Jonathan Swift, a manuscript novella dated 1818, and rare books by James Joyce. All items displayed in the exhibit were selected from materials held in the University Libraries' Department of Special Collections. James Walton (Professor Emeritus of English, Notre Dame). An online searchable version of A Guide to Irish Fiction 1650 - 1900, produced in print form by Rolf and Magda Loeber, is now available. This exhibit presented a selection of British and American books, periodicals, and other printed matter dedicated to the sport of boxing. With one or two exceptions, all items were published between 1720 and 1960. Among athletic sports, boxing is notable for its long and colorful literary history. The earliest boxing books were printed before 1750, but publications appeared only sporadically until c1790, and the onset of the "golden age" of the English prize ring. The following forty years witnessed the growth of a remarkable body of literature dedicated to the ring and its culture, epitomized by the 5-volume Boxiana of Pierce Egan. The very practice of sports journalism emerged within this cultural context, and several now-familiar genres – the sports magazine, the sports record book, the ghostwritten autobiography of the celebrity-athlete – likewise made their appearance. American publishers made few original contributions to the boxing literature until late in the 19th century, when Richard Kyle Fox chose prizefighting as a topical focus of his sensational illustrated weekly, The National Police Gazette. American coverage of the sport deepened and diversified after World War I; most notable was the appearance in 1922 of Nat Fleischer's monthly The Ring, which soon became the most influential publication in the sport's history. All items displayed in the exhibit were selected from the extensive collection of boxing-related materials held in the Hesburgh Libraries' Special Collections. George Rugg, Curator in Special Collections, was curator for this exhibit. For additional information, visit the exhibit's Web site. This exhibit displayed books by and items relating to Edward Gorey (1925-2000). In addition to cases containing samples of books written, illustrated, and designed by Gorey, there were cases focusing on his love of the ballet, his involvement in the 1978 production of Dracula, and the commercialization of Gorey's distinctive style. This exhibit was a small representation of the Edward Gorey Collection, more than 400 items held in the University Libraries' Department of Special Collections. The core of the collection was donated to the Libraries by Gorey collectors Suzy Conway and her brother Robert Conway ('66, '05 LL.D). Additional items were purchased through their generosity. Cheryl Smith, Education and Psychology Reference Librarian, was curator for this exhibit. The books in this exhibit shared the common theme of recording and preserving the past in Great Britain and Ireland. They were published in the seventeenth, eighteenth, and early nineteenth centuries. While various types of books were included in this exhibit, the majority were antiquarian works that dealt with the material culture of what we now consider the Middle Ages. Arranged chronologically, they revealed the development of the field of archaeology from an amateur pursuit by gentlemen to a profession with stringent rules for accuracy. Laura Fuderer, Subject Librarian for English and French Literatures, was curator for this exhibit. This exhibit used manuscripts, rare books, and official publications from the Southern Cone History Collection at the University of Notre Dame to document the political history of the River Plate region (Argentina, Paraguay, and Uruguay), particularly Argentina, between 1810 and 1852. The documents were arranged into the following themes: "Precursors to Independence," "Early Independence," "Rise of the caudillos," "Juan Facundo Quiroga," "Rule of Rosas," "Critics of Rosas" and "Gaucho: Horseman of the Pampas." Following independence in 1810, efforts to create a national government failed. Instead, provinces became autonomous political states led by caudillos, political leaders. Paraguay and Uruguay broke away to form separate nations. Civil wars raged in the remaining provinces between those that championed a federalist nation-state those that wanted a strong centralized government based in Buenos Aires. In 1829, the newly elected governor of the Buenos Aires province, Juan Manuel Rosas, created an alliance among the federalists that defeated the centralists. Through the use of propaganda and violence, Rosas would rule over Argentina until toppled from power in 1852. Scott Van Jacob, Iberian and Latin American Studies Subject Librarian, curated the exhibit. For additional information about this exhibit and the political history of the River Plate region between 1810 and 1852, visit the exhibit's Web site. This exhibit was curated by Marina Smyth with assistance from Linda Major, both of the Medieval Institue Library, in conjunction with Prof. Aideen O'Leary of the Keough Institute for Irish Studies, which hosted the Celtic Studies Association of North America Annual Conference in May 2002. Laura Fuderer organized the case within the display on the theme of Antiquarianism and Nationalism, which was geared to the interests of participants in the Samuel Johnson Society annual meeting, which was also held on campus in May 2002. This exhibit provided an overview of the Civil War manuscript material held in the Department of Special Collections and in the University Archives. Selections came from seven wartime letter collections, whose authors range from a New Hampshire private to Major General William T. Sherman. Also included were three soldiers' diaries and a group of manuscripts relating to the trial of Captain Henry Wirz, commandant of the Confederate prison camp at Andersonville. For additional information about American Civil War Era manuscript material held by the Department of Special Collections, please visit the collection description and digital project at our Web site. The William T. Sherman Family papers are held by the University Archives — more information about these documents is available from the University Archives Web site. This exhibition featured eighteen of the finest pre-1600 bound manuscripts held by Notre Dame, from the very first given to the University in the 1870s to an early 15th-century Middle English devotional manuscript acquired in 2000. The exhibit was presented in conjunction with a conference, Medieval Manuscripts at Notre Dame, which was held on campus September 13-15, 2001. Banned books and burnings leap to mind at the mention of the Spanish Inquisition. These and other inquisitorial activities were examined in this exhibition which drew on an extensive collection of original printed and manuscript documents from the Inquisition purchased through the generosity of Harley L. McDevitt in 1996. Included in the exhibit were papal and royal decrees, manuals of instruction used by inquisitors and certificates authorizing their corps of lay assistants (the familiares). Also featured were indices of prohibited books and examples of texts that were expurgated as well as records of inquisitorial trials and contemporary images of autos-da-fé. Polemical works published by Protestants document the rise of the "Black Legend" and popular perceptions of the Inquisition in the 18th and 19th centuries. Through the documentary evidence presented, a complex picture emerges of the societal impact of inquisitorial activities in Spanish lands and Portugal as converso Jews, Protestants, witches and inhabitants of the New World all encountered persecution. For additional information about the Harley L. McDevitt Collection on the Spanish Inquisition and descriptions and images from selected items, please visit the Inquisition Collections Digital Project. This exhibit featured selections from the University's extensive collection relating to the life and work of 20th-century British stone carver, wood engraver, typographer and book designer Eric Gill and his association with the St. Dominic's Press and Golden Cockerel Press. Additional items on loan from the University of San Francisco highlighted Gill's contributions to these rather different private presses. Complementing the Special Collections exhibit, the Snite Museum of Art hosted an exhibition of original sculptural works by Gill on loan from the Harry Ransom Humanities Research Center at the University of Texas, Austin, complemented by graphical works from Notre Dame's Gill Collection. The Snite Museum exhibit was open November 12, 2000, through February 4, 2001. In conjunction with the above exhibitions, an international conference "Eric Gill: The Appeal of an Integrated Life" was held at Notre Dame on November 17-19, 2000. For more information about the exhibitions and conference please visit the conference's Web site. This exhibit explored the individual careers and some of the collaborative ventures undertaken by Jorge Luis Borges, Adolfo Bioy Cesares, Oliverio Girondo and Silvina Ocampo. It ascribed their emergence in the early 1920s to both the creative impetus they gained from European contacts and to the inspiration and guidance of native writers like Ricardo Güiraldes, who sought to revitalize contemporary Argentine literature by championing the mythical revival of national folk heroes. It then followed their struggles and rejection over the next two decades, to the first glimmers of critical and popular acceptance in the 1940s, and to national honors from the late 1950s. For more information about the O'Grady Southern Cone Collection, please visit our the collection description at our Web site. This exhibit highlighted the historical development of facsimile technology, as well as the central place of facsimiles in the study of the Middle Ages. Medieval manuscripts that survive to this day are precious because of the mere fact of being old; they are witnesses to a culture which prevailed a long time ago and strongly influenced the world in which we now live. Because of the rarity, expense, and importance of preservation, libraries must often restrict the access of scholars to these precious artifacts. Much of the work that needs to be done—studying the layout, comparing scripts, etc.—can be done with an accurate facsimile without the risk of damage to the original. And, of course, facsimiles also appeal to those who love beautiful books for their own sake. For more information about this exhibit, please consult the PDF of the exhibition catalog (17 MB).